A & B - The Bible for the Young: Genesis, Lessons 17-24, by Dr. Paterson Smyth (P.N.E.U. Office, 1/6). St. Luke's Gospel (S.P.C.K. Commentary, 9d. ), chapters 16-24. Teacher to prepare beforehand and to use Bible passages in teaching, and to add such comments (from Paterson Smyth, say,) as will bring the passage home to the children. Children may use The Shorter Bible (Dent, 2/6); S.P.C.K. Bible Atlas (1/-). Sunday Reading (optional): When I was a Boy in Serbia (Harrap, 3/6). Hymns by Keble. How to Use the Prayer Book, by Mrs. Romanes (Longmans, 2/-). English Church History for Children, Vol. II. (Methuen, 5/-). The Children's Year (Church Seasons), by the Rev. G. R. Oakley (S.P.C.K., 3/6). Sidelights on the Bible, by Mrs. Brightwen (R.T.S., 3/-). For private daily Bible reading children may use Lectiones forYounger Children (Spottiswoode, 1d. each). A Boy's Book of Prayer, by A. Devine (Methuen, 2/-). A & B A New Handwriting,* by M. M. Bridges (P.N.E.U. Office, 5d. a card): practice card 3. Transcribe, with card 6 as model, some of your favourite passages from The Tempest. Two perfectly-written lines every day. A & B Two pages at a time to be prepared carefully: then a paragraph from one of these pages to be written from dictation, or, occasionally, from memory. Use the books set for reading and history. A Stories from work set in (a) Citizenship and Reading, or, (b) events of the day, etc. B Stories from reading. Children in B who cannot write easily may narrate part. Parse and point out Subjects, Verbs, Objects. A Meiklejohn's Short English Grammar* (2/-), pp. 1-18; 106-118. B How to Tell the Parts of Speech,* by E. H. Abbott (Seeley, 2/6), pp. 55-74. Teacher study preface. A & B A History of England,* by H. O. Arnold-Forster (Cassell, 8/6), pp. 719-726; 745-806 (1820-1861). Black's History Pictures: The "Modern England" Period (2/6), may be used. A Social Life in England through the Centuries,* by R. H. W. Hall (Blackie, 2/9), pp. 64-96. A & B A First History of France,* by L. Creighton (Longmans, 5/-), pp. 279-290 (1820-1861), to be contemporary with English History. The Story of France, by M. Macgregor (Jack, 12/6), may be used instead. A The British Museum for Children,* by Frances Epps (P.N.E.U. Office. 3/9), chapter 8. Teacher study preface. Keep a book of Centuries (P.N.E.U. Office 8/-), putting in illustrations from all the history studied during the term. The Great War, by C. R. L. Fletcher (Murray, 6/-), pp. 29-66. A North's Plutarch, edited by P. Giles (Cambridge Press, 8/6): Timoleon. Smith's Smaller Classical Dictionary (Dent, 2/6). The Citizen Reader,* by H. O. Arnold-Forster (Cassell, 2/6), pp. 198-224. B Stories from the History of Rome,* by Mrs. Beesly (Macmillan, 2/6), pp. 168-189. The Complete Citizen,* by Dr. R. Wilson (Dent, 8/-), pp. 104-189. A The Ambleside Geography Books, Book III. * (8/6), pp. 241-276. B Book III.,* pp. 65-102. A The Great War,* pp. 29-66 (to be read with good map). A & B Round the Empire,* by Sir George Parkin (Cassell, 3/6), pp. 97-122. Phillips' Atlas of Comparative Geography (new edition, 3/-). Map questions to be answered from map in Geography Book and then from memory before each lesson. All Geography to be learnt with map. Children to make memory maps; see also tests under Scouting. Teacher may find Outdoor Geography, by H. Hatch (Blackie, 3/-) useful. A & B The Sciences,* by E. S. Holden (Ginn & Co., 4/6), pp. 110-147. Children should make the experiments where possible. Keep a Nature Note-book (P.N.E.U. Office, 8 1/3 d., and see Home Education.) Make special studies for the season with drawings and notes. The Changing Year, by F. M. Haines (Wadsworth, 8/-), or, Countryside Rambles, by W. S. Furneaux (Phillip, 2/6): April to July. [Furneaux's Nature Study Guide (Longmans, 6/6), may also be used for reference for out-door work.] See also tests under Scouting, Parents' Review, June, 1920. B Madame How and Lady Why,* by Charles Kingsley (Macmillan, 6/-), pp. 176-231. Jack's Insects,* by E. Selous (Methuen, 3/6), pp. 62-83. A & B Reproductions* of six pictures by J. F. Millet (P.N.E.U. Office, 2/-). Teachers see notes in the April Parents' Review, 1921. Teacher should use The Teaching of Mathematics, by I. Stephens (P.N.E.U. Office, 6d.). A A New Junior Arithmetic,* by Bompas Smith (Methuen, 4/-), pp. 156-158; 102-118. Much care with tables and rapid oral work. A. Lessons in Experimental and Practical Geometry,* by Hall and Stevens (Macmillan, 2/6), pp. 33-43. The School Set of Mathematical Instruments (Macmillan, 2/-). A. A First Latin Course,* by Scott & Jones (Blackie, 2/6), pp. 21-43, each lesson to be followed by narration; or, Young Beginners' First Latin Book* (Murray, 2/6), pp. 24-29; with corresponding exercises, questions, and vocabularies. A. Siepmann's Primary French Course,* Part I. (Macmillan, 3/-), Lessons 10-12 inclusive, with grammar and exercises. Teacher read aloud, translating with the children's help, and children afterwards narrating in French. French Fables in Action, by V. Partington (Dent, 2/), pages 32-42. B. Siepmann's Primary French Course,* Part I. (Macmillan, 3/-), Lessons 1-3 inclusive, with grammar and exercises. French Songs, by Violet Partington (Dent, 9d.). A & B Six (a) wild flowers, (b) studies of animals, that you have been able to watch, (c) people at work in the fields, in brush-drawing. Original brushdrawings from scenes in books set for reading. Paint-box with specially chosen brush and colours (P.N.E.U. Office, 3/-)*: pencil must not be used. A & B Psalm 105, and two suitable passages of twelve verses each from (a) Genesis, (b) St. Luke's Gospel. Two hymns (by Koble). A scene from Shakespeare's The Tempest, or, two of Southey's Ballads, or forty lines from Macaulay or Scott. A & B Books set for Geography, History and Recitations should afford exercise in careful reading. Shakespeare's The Tempest* (Blackie; Plaintext Edition, 7d.). Southey's Ballads* (Blackie, 3d.). A Bulfinch's Age of Fable* (Dent, 2/6), pp. 156-186. Kingsley's Water Babies* (Dent, 2/6). Scott's Marmion* (Blackie, 1/-). B The Heroes of Asgard* (Macmillan, 5/-), pp. 163-211. Macaulay's Lays of Ancient Rome* (Blackie, 1/-). Marrayat's Children of the New Forest (Collins, 2/-). Continue Child Pianist (Curwen & Son); teacher using the Teacher's Guide (revised edition, 7/6). Programme of Music (Mozart) to be heard: Parents' Review, April, 1921. Two English songs from The National Song Book, edited by C. V. Stanford (Boosey & Co., words and voice parts 1/6 each,* complete with music 6/-). Two French songs. A Book of French Songs (treble only, Blackie, 7d. each), may be used. Fifty Steps in Sight-Singing, by Arthur Somervell, steps 11 and 12, inclusive (Curwen & Son, 2/6). Teacher use also Ten Minutes' Lessons in Sight-Singing, lessons 28-34 (Curwen, 2/6). Syllabus of Physical Exercises (Eyre & Spottiswoods, 1/-), tables 83-86. Ball Games and Breathing Exercises, by Alice R. James (Longmans, 1/9). Music for use in Mrs. Wordsworth's Classes (P.N.E.U. Office, 3/6), may be used. Peasant Dances and Songs of Many Lands, by Mrs. Kimmins (Evans, 7/6). Skipping. Ex-Students take House of Education Drills. Teacher would find useful How to Teach School Dances (Evans, 4/6). Help in house or garden. Claymodelling (Boutledge, 9d.). The Little Girl's (a) Sewing Book, (b) Knitting Book (R.T.S., 2/6 each), or very desirable, Needlecraft in the School, by M. Swanson (Longmans, 7/6); teacher read letterpress with discretion. Children make a garment (see the needs of the "Save the Children Fund," address: 29 Golden Square, Regent Street, W. 1). Boys and girls mend clothes from the wash each week: First Lessons in Darning and Mending (P.N.E.U. Office, 2d. ), may be used. See also tests under Scouting (Parents' Review, 1920). Teacher would find useful What shall we make? By M. La Trobe Foster (G.M.S., 1/-). * In home schoolrooms where there are children in A as well as in B, both forms may work together, doing the work of A or B as they are able. N.B. - The prices of books are constantly rising; those given are the latest before going to press. N.B. 1. - In grammar (English and foreign) and in mathematics there must be no gaps. Children must go on from where they left off. N.B. 2. - Each child in A and B should have a copy of all books, etc., marked * and a set of the Pictures and materials. One copy of the other books is sufficient. The books from "Recitations" onwards are advisable but optional. N.B. 3. - For methods of teaching the various subjects see Home Education, 5/6, School Education, 5/- (P.N.E.U. Office). N.B. 4. - All books, etc., may be obtained from the Secretary of the PNEU, 26, Victoria Street, London, S.W. 1, as well as exercise books bearing the school motto (ruled single, double lines and squares), 8 1/2 d. each, and Cambridge paper for the Examination 2/6 for 4 quires (not less); envelopes to match 1/6 a packet. Also the School Badge (6/-). School Hat Band (4/6), and Ribbon 3/6 a yard. Badges stenciled in washing colours on pale blue linen may also be obtained, 4 1/2 d. unmounted, 6d. mounted. N.B. 5. - Members are particularly asked to follow the notes under Our Work in the Parents' Review. N.B. 6. - This Programme is for Members of the School only and must not be lent. Specimen copies of old Programmes can be obtained by members from the Secretary, House of Education, Ambleside. N.B. 7. 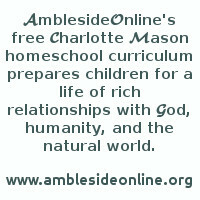 - All letter re School and Programmes, except book orders, should be sent to Ambleside. The enclosed Order Form for books should be used. Members are asked to send the School Fee direct to Ambleside. P.N.E.U. subscription, money for books, etc., should be sent to the London Office.